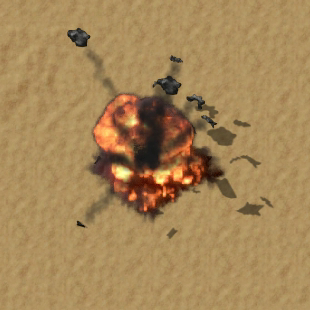 The explosive cannon shells are the basic ammunition for the Tank along with cannon shells. Once enough research is conducted, explosive uranium shells are made available, which are equal or superior in all regards. Since regular shells are still specifically required to manufacture uranium variants, any previously manufactured stockpile can be "upgraded" without waste. Explosive cannon shells deal lower physical damage and their piercing power has practical use for only the smallest enemies. In turn, they make up for it with an even greater amount of explosive damage that is dealt to multiple targets within radius. The total amount of damage dealt on the shell is greater than its physical counterpart, but it must be noted that worms, nests and especially spitters have considerable explosive resistance that well compensate for this damage increase. However, thanks to the greater raw numbers, upgrades have greater impact on the shells' potential, and their area-of-effect proves valuable later on in the game. This page was last edited on 25 August 2018, at 11:48.